Our semi-private sessions are geared toward those who desire the results of a personal trainer without the huge expense. With just 2-5 people per session, each person receives the element of personal attention and accountability from a skilled fitness coach. Our coaches are here to provide you not only assistance, but to educate you during your transformation. We teach you everything from the basic movements, mechanics and recovery. Having this knowledge provides you the tools needed to continuously grow and strengthen. All of our sessions are varied so that you never become bored with your workout. However, the general layout remains the same: warm up/ stretching, high intensity interval training then a "finisher" followed by cool down/ stretching. Measuring everything from strength, mobility,fitness to body composition is far more important than looking down at numbers on a scale. Sure... watching the numbers drop is great, but when performance starts to improve,image/aesthetics/body weight will also start to get better. Once your nutrition is dialed in and your training is going to plan there is no reason why you cant hit your goals. These sessions are catered toward you, even though they are group workouts. How so? Our coaches get to know you and become aware of what you can and can't do. They are skilled in adapting the movements for each individual so that everyone gets a great workout in the same session. Let's face it... working out alone can be boring. When you have your coach and friends along side you, you're going to be more accountable. Which in the long run, helps you achieve your goals! Our program is designed for people with busy lives. We pre-plan each session and have it all laid out for you, so you don't have to think or wonder. Rather than hopping on the treadmill while pondering what else you should be doing or searching for another open machine, we take advantage of your valuable 45 minutes and provide you the best full body workout. One-on-one personal training can be really expensive for most people. On the flip side, a gym membership can be very inexpensive, but it's crazy if your rarely showing up and spend the whole time cluelessly debating what you should be doing... or even worse, the equipment you want to use isn't available. With group training sessions, you get the same benefits and results of one-on-one personal training for a fraction of the price. To learn more details, give us a call at 254-666-6016. Do you have trouble finding time to exercise? BEST to get you QUICK RESULTS? reduce joint inflammation and stiffness? 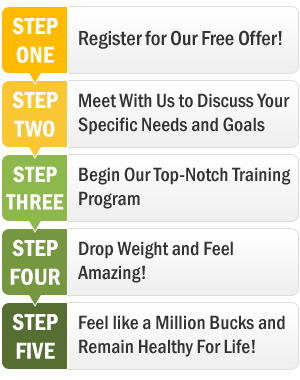 Do you feel stuck at your current weight and don’t know what to do or where to start? Are you FINALLY ready to make a change this year? We’ve unlocked the SECRET to FAT LOSS! Call (254) 666-6016 to get scheduled! For all this and more, just enter your details in the box to the right , click the button and we'll be in touch within the next 48 business hours to schedule your complimentary Nutrition & Fitness Assessment. Click HERE to Request Your Free Nutrition & Fitness Assessment HERE ($87 Value)!